A boutique family-owned winery located in the Green Valley sub-appellation of the Russian River Valley specializing in small lots of single vineyard Pinot Noir and Zinfandel. Bob and Rosemary Appleby own and operate the winery. Bob started out making wine in his woodworking shop, became quite a successful amateur winemaker launched the commercial venture in 2001. 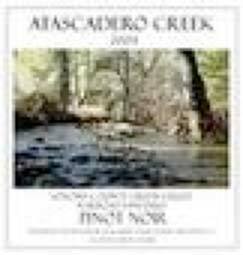 The winery is named for Atascadero Creek, which flows near the winery and the owners' residence in Graton. Pinot Noir is sourced from a small estate vineyard in the Green Valley appellation and other vineyards in the Chalk Hill, Sonoma Coast and Russian River Valley. The wines are sold on the website and distributed locally. They are priced sensibly considering the high quality. A mailing list is available. 707-824-8204.